THE LIBERATION OF the Nazi concentration camps at the end of World War II gave the world a new atlas of atrocity. Ever since, place names such as Auschwitz and Bergen-Belsen have been synonyms for evil. But during the war itself, if you had asked Americans to name a single place that summarized the reason they were fighting against Nazism, the most popular response would have been Lidice. On the night of June 9, 1942, Gestapo units surrounded this Czech village of some five hundred souls and wiped it off the map. All the men over the age of fourteen were shot on the spot; the women were deported to the Ravensbruck concentration camp and killed there. The children were subjected to a racial screening test: nine of them were found to be potentially “Germanizable” and were sent off to live with German foster parents, while the rest were murdered. The Gestapo went on to burn down every house in Lidice and then bulldoze the ruins. Many of the Nazis’s worst crimes were carried out in secret, under the cover of battle or of bureaucratic euphemism. But the destruction of Lidice was not one of these hidden atrocities. On the contrary, the Nazis bragged about it, making sure that news of what happened to Lidice spread throughout occupied Europe. That was why Hitler had personally ordered its destruction in the first place—to show what lay in store for any European country that dared to resist Nazi rule. 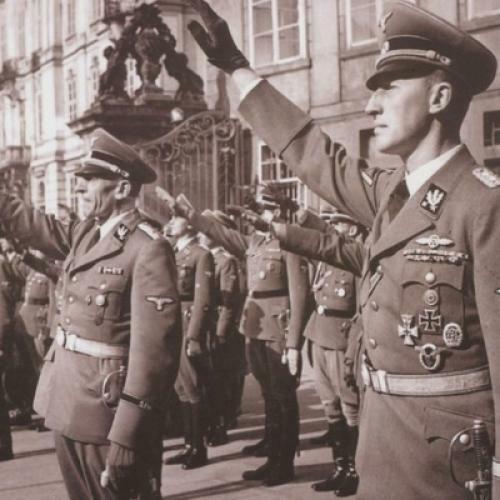 For two weeks earlier, on May 27, 1942, Prague had been the scene of one of the most daring acts of anti-Nazi rebellion in the whole war: the assassination of Reinhard Heydrich, the Nazi ruler of occupied Czechoslovakia. But others called him, admiringly, “the blond beast,” suggesting that Heydrich incarnated, physically and morally, the Aryan ideal. Indeed, compared to such poor specimens as Hitler, Himmler, and Goering, Heydrich—tall, blond, and handsome, a fencing champion and fighter pilot who also played the violin—was a poster boy for Nazi manhood. His assassination was thus a major blow to the Nazi leadership and their myth of invulnerability. The death toll of Lidice, plus the thousands of others killed across the Czech lands after the assassination, suggests what a high price Hitler and Himmler put on the life of their henchman. From the moment it happened, the killing of Heydrich became one of the most dramatized and mythologized episodes of World War II. Within the year, it was the subject of a novel by Heinrich Mann and a film, Hangmen Also Die!, directed by Fritz Lang and written by Bertolt Brecht. A series of novelizations, popular biographies, and TV and film versions followed over the decades—there was even a memoir by Heydrich’s wife Lina, titled My Life With a War Criminal. In the wake of all these, and of Gerwarth’s definitive biography, one might well ask whether there is any point in retelling the story yet again. No one has asked himself that question more often than Laurent Binet, who sets out to tell it again in the newly translated novel, HHhH. Novel, though, is not really the right word for this book, even if it did win the Prix Goncourt du Premier Roman in 2009. What Binet has really written is a book about the obstacles to writing a novel about Heydrich—a record of all the reasons why this story does not need to be told, cannot be told, and should not be told. In a series of short numbered sections, Binet alternately narrates the life of Heydrich and the plot to assassinate him and speaks in his own voice, describing his own research methods, giving glimpses of his own personal life, and pointing out all the flaws in his own narration. The only way to overcome his doubts about the whole enterprise, Binet suggests, is to place them front and center. The result is a book that, in its relentless authorial self-consciousness, seems to court the description “postmodern.” Consider the moment when Binet declares his intention of naming the book Operation Anthropoid, after the code name used by the British Special Operations Executive for the plan to kill Heydrich. “If that’s not the title you see on the cover,” he writes, “you will know that I gave in to the demands of my publisher, who didn’t like it: too SF, too Robert Ludlum, apparently.” Of course, it is not the title on the cover, though the one Binet settled on is even more cryptic. HHhH is an acronym for a German phrase meaning “Himmler’s brain is called Heydrich,” which was used to explain Heydrich’s crucial role in the SS. Binet could perfectly well have omitted this passage after he changed the title. By leaving it in, he creates the illusion of total access to the author’s thought process: what really matters, Binet suggests, is not the story he tells but the decisions he has to make while telling it. The inspiration of HHhH is not ironic, then, but deeply earnest. And in this context the novelist’s power to shape and to invent feels less like a privilege than a curse. For every time Binet makes something up, it is a reminder that he cannot know all the facts. “My story has as many holes in it as a novel,” he writes, “but in an ordinary novel, it is the novelist who decides where these holes should occur.” Thus Binet goes back and forth several times over the question of whether the car Heydrich was riding in when he was assassinated was black or dark green: it is impossible to tell from black-and-white photographs, yet somehow he has a recollection of seeing a green car in a museum. More fundamentally, Binet is faced with the problem that the villain of his novel is much better documented than its heroes. “I have a colossal amount of information about Heydrich’s funeral,” he writes, “but that’s too bad, because I don’t really care.” Yet he acknowledges that the danger in writing about a man as vividly evil as Heydrich is that he will engross any book he appears in—that evil will turn out to be more narratable than good: “Whenever I talk about the book I’m writing, I say, ‘My book on Heydrich.’ But Heydrich is not supposed to be the main character.” The evolution of Binet’s title, however, from Operation Anthropoid to HHhH, suggests that he was unable to stop Heydrich from becoming his focus. Following this logic, Binet suggests that the flaws of HHhH are evidence of the incurable frivolity of fiction. This is the aesthetic frivolity that Paul Valéry invoked when he explained that he could never write fiction, because he could not bring himself to write a sentence like “The marquise went out at five o’clock.” Already a hundred years ago, in other words, the conventions of the novel—the observations of class and custom, the illusion of specificity—struck Valéry, and other modernists, as stultifying and untrue to life. If this is a flaw in an ordinary novel, Binet argues, it is still more problematic in a historical novel, where the vapidity of convention hides crucial truths. The object of Binet’s contempt, it seems, is nothing less than the imagination itself. In his view, the imagination is a form of mediation—it brings close something that is far from us, giving us the illusion of witness and participation. But when it comes to a historical event, the need for such mediation is a reminder of our distance from the original, of the inauthenticity of our relation to the past. This paradox is why Holocaust fiction has always been such a morally contested subject: to imagine the suffering of the victims is both to assert our solidarity with them and to demonstrate that we are not actually among them. But while Binet describes these scenes and even includes a section on the massacre of Ukrainian Jews at Babi Yar, HHhH is not primarily a work of Holocaust fiction. What it shows, rather, is that for a novelist to describe a heroic moment in World War II is almost as problematic as describing a tragic one. The climax of Binet’s book comes, inevitably, with the assassination itself. He describes how Gabčík and Kubiš lay in wait for Heydrich’s car along its usual route from his home to Prague Castle, where he had his office; how Gabčík leapt in front of the car and attempted to open fire with a submachine gun, only to have the gun jam; how Kubiš threw a grenade but missed his target, causing an explosion that Heydrich initially seemed likely to survive. Then he narrates the dramatic days after the incident, as Heydrich first improved, then succumbed to septicemia—a dose of penicillin could have saved him—while frantic SS and Gestapo men combed Prague for the assassins. They were finally found in the crypt of a church, where they hid after one of their fellow resistance members betrayed them, seemingly in order to claim the enormous reward the Nazis offered. Finally Binet describes the stand-off at the church, as the trapped fighters held off the SS as long as they could, before committing suicide. The passage communicates the noble spirit that makes HHhH affecting. All Binet’s quibbles about the mendacity of fiction would seem old hat were it not for his urgent feeling that he must give Gabčík and Kubiš their due. In his sense that this is impossible, that the present is too shrunken to contain the dimensions of the past, Binet captures something authentic about the way we now relate to history—especially the history of World War II. For all the dramatic changes in the world since 1945, it is true that, imaginatively, we are still living in the shadow of the war. Nothing has happened since the war that more powerfully defines our moral and political world. And if our works of the imagination are unable to measure up to that epic past, it is because we ourselves feel that we do not measure up. We remain in the war’s thrall and under its tutelage, compelled to remember and re-teach the lessons humanity learned from 1939 to 1945—about our capacity for evil and destruction, and about the possibility of resistance to evil. But were they? For all the doubts that Binet allows about his own capacity to understand and relate their story, he allows no doubt to stain Gabčík and Kubiš themselves. It is revealing, for this reason, to read the book alongside Hitler’s Hangman, Robert Gerwarth’s biography of Heydrich, which offers a much more nuanced political context for Operation Anthropoid. There is no gainsaying the personal courage of Gabčík and Kubiš. But the reason they were sent to kill Heydrich, Gerwarth writes, was a political calculation by Eduard Beneš, the president of the Czechoslovak government-in-exile in London. By 1942, the Czechs were proving the most quiescent of all the peoples of occupied Europe. Without some spectacular act of resistance, Beneš feared that he would lose any influence on the Allies’ decision-making about the future of Czechoslovakia. (In particular, he wanted leverage in order to secure the Allies’ permission to expel the German population of the country after the war.) Beneš knew that Operation Anthropoid, even if successful, would cost the lives not just of Gabcik and Kubis, but of practically the entire Czech resistance. He was willing to make that sacrifice to attain his diplomatic goals, and the gamble worked. It is hard to say that Beneš was wrong: like every wartime leader, he had to weigh the value of individual lives against the need for victory over the Nazis. But the ironic result was that, as Gerwarth writes, “through his death, Heydrich had inadvertently fulfilled one of his … missions in Prague: the complete and lasting ‘pacification’” of the country.